The Gefen EXT-HDMI1.3-CAT6-8X is a 8x CAT6 Extender for HDMI which is a companion product for any 8X8 Matrix for HDMI solution. It takes Hi-Def sources routed by the matrix to any eight extended HDTV displays up to 200 feet (60 meters) away. This HDMI product supports a variety of HDMI 1.3 features including: Deep Color, Multi-channel audio, Lip Sync, CEC controls and 3DTV. Additional features include an extension for IR Remote for AV source control from the remote locations, IP Control and RS232 control for the over all system routing and management. This Gefen HDMI CAT6 Extender supports the HDMI 1.3 specification with features like 1080P Full HD, and compressed lossless audio formats such as Dolby TrueHD and DTS-HD Master Audio. The CAT6 Extender's pure digital transmission method insures 100% signal integrity over a single cable extension solution. The Gefen 8x CAT6 Extender for HDMI system consists of one Sender and eight Receiver units. Up to eight Hi-Def sources (set-top box, Blu-ray, DVD player or gaming console) can be connected to the Sender unit with the supplied one-foot HDMI cables. The Receiver units connect to HDTV displays. One CAT6a cable links the Sender and Receiver units at distances of up to 200 feet (60 meters) away. Each Receiver unit is connected by HDMI to the HDTV Display. The Sender is powered using a 24VDC power supply and the Receiver units are supplied by 5VDC locking power supplies. When used as an add-on extension to HDMI when the system uses any 8x8 Matrix system as the required solution. In this case simply connect a CAT6 cable between the Sender unit and Receiver units for each zone (room). The unit's other purpose is to extend eight (8) separate HDMI signals at long-range (200 feet/60 meters) over CAT6 cable to any HDTV display. Optionally, IR signals can also be extended, adding remote control of any IR functionality located at the source end. An optional IR remote control (sold separately) can be used at the Sender to control the routing or at each Receiver to control each individual zone. Additional control is possible via any HTTP-Compliant Web Browser (IP Control) or by using RS232 control. 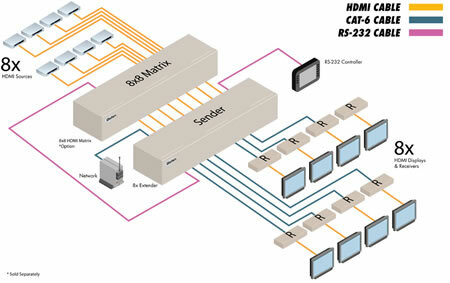 The Sender unit also has a unique feature that can apply control to the IP control and RS232 control of the 8x8 HDMI 1.3 matrixes: simply connect the supplied RS232 cable to the Matrix's RS232 input and the 8x CAT6 Extender for the HDMI Sender unit's RS232 output. Note: HDMI 1.3 Features Supported: Dolby TrueHD & DTS-HD Master Audio, Deep Color Supported (x.v.Color), 225 MHz (up to 12 bit YUV 444 @ 1080p), CEC Protocol Pass-Through, Lip-Sync Pass-Through, 3DTV. Also, this product is an HDCP pass-through device. Consumption 60 W max. 10 W max.